What separates the Fitness Factor Playground Ball from the competition? Our playground ball is made with the strongest, most durable materials available and constructed to the most rigorous standards. It is built for intense use and built to last. The Fitness Factor Playground Ball is official adult kickball (WAKA) size, making it perfect for both adults and kids. 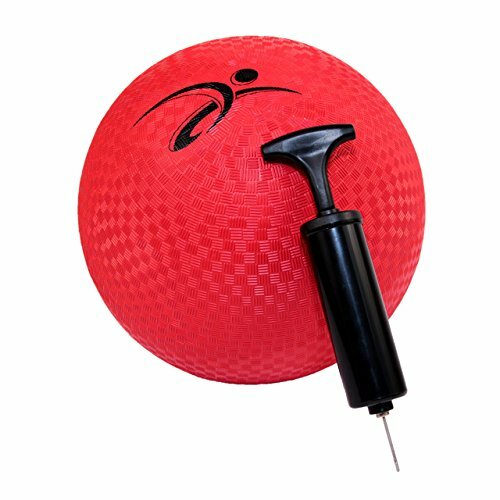 Its 10" diameter plus durability make it perfect for users young and old as they play four square, dodgeball, or any number of other games. Fitness Factor makes it a point to listen to its customers and address their needs. That's why we offer a durable alternative to standard playground balls that includes a grip-friendly surface and a ball pump for inflation. The added comfort and ease of use is part of our commitment to you and making sports and games as care-free as possible. We stand by our products to the end. If you don't like your playground ball or it breaks, we'll quickly and happily provide you with a refund or replace your product at no cost to you. That's the power of the Fitness Factor Warranty and 100% Satisfaction Guarantee. The Fitness Factor Advantage: Join over 50,000 others and keep a smile on your and your child's face with our sturdy red playground ball. Order now! If you have any questions about this product by Fitness Factor, contact us by completing and submitting the form below. If you are looking for a specif part number, please include it with your message.